THIS REALLY HAPPENED….What would you do? KW CRECO was recently tasked with disposing of a partially completed development project on behalf of a new client. In preparing our listing materials and due diligence packages, our team of estimators had identified several errors in the submitted construction documents and development plans. These were necessary items that were either not included in the bid documents, or were the result of mistakes in the coordination between the architectural and mechanical drawings, leading to several open change orders that will be necessary for the proper development of the site. When approached about the errors, the Seller acknowledged that these shortcuts were done intentionally as a cost-savings strategy and we were instructed to proceed with the liquidation of the property. Shortly after listing, an offer was received and accepted. However, it became evident that the new buyer did not identify the errors contained in the development plans. Should we highlight this information and disclose the errors to the purchaser (who maintains many local relationships with our desired client base) or should we look the other way and leave ambiguous disclosures in place to protect our client from the Buyer’s oversights? Client allegiances aside, some of the errors either made glaring misrepresentations to the public or posed potential safety hazards for the building’s future patrons. There is never a right way to do the wrong thing. The act of intentionally omitting information from a construction bid can clearly be interpreted as unethical, inappropriate, and wrong. The construction industry represents a hectic and complicated business environment where every dollar and every action are key drivers of a project’s success. While a construction company has an inherent responsibility to its stakeholders, it must also uphold the integrity and principles it has represented to its client. The environment and economy in which contractors bid construction projects are not black and white. There are many areas where a contractor’s personal professionalism and ethical fortitude will stand out and ultimately lead to profitability for its stakeholders. However, given the slightly blemished connotation of the construction industry, commercial brokers must acknowledge that a commitment to professional integrity and ethical conduct is paramount in an industry riddled with negligence, conflicts of interest, fraud, unfair conduct, bribery, etc. However, the given scenario presents an internal conflict, which may be inherent within many broker-client-developer relationships – “Does the broker have an obligation to its stakeholders or its client?” While the answer may require a commitment to a long-term time horizon, a truly successful agent will work to align the objectives and benefits of both the stakeholders and the client. 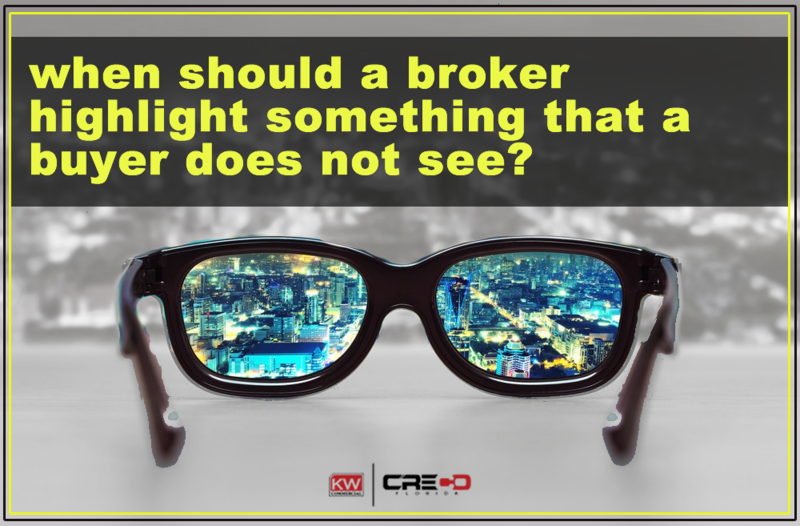 If brokerage reputation is of paramount importance to the agent, it is critical that any and all discrepancies within any bid offering be disclosed and discussed with the project’s owner before the solicitation of any sale to the public. While this strategy may not prove immediately successful in each and every listed property, this level of integrity and transparency will carry a significant amount of weight within the marketplace. The irrational behavior of a single client cannot outweigh the ethical desires and honesty requirements of the market. Under this notion, transparent and ethical conduct will ultimately lead to value creation for the construction firm’s stakeholders. As the commercial division of Keller Williams Realty, KW CRECO is committed to maintaining the same level of client satisfaction and ethical behavior as its residential counterpart. Please contact KW CRECO or Brad Kuskin if you have any questions about your commercial real estate investment project.